Dr. Ciara Conlan held a series of events in memory of her mother, Jackie who was a much-loved staff member of St. James’s Hospital. 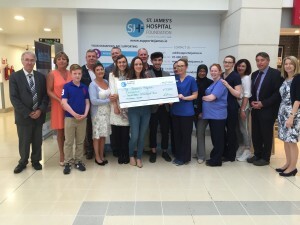 Supported by family and friends, an amazing €17,200 was raised for the Donal Hollywood Ward. 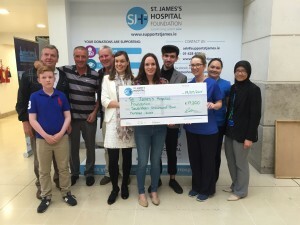 Ciara, her father Ollie, sister Lisa, brother Colm and family members presented the cheque at a small reception held this week to remember and celebrate Jackie’s life. The ‘Jackie’s Wish’ fundraiser included a fashion show and two drag hunts. Heartfelt thanks to Ciara, her family and friends and everyone who helped make ‘Jackie’s Wish’ so successful, including Robert Pywell who ran the Dublin marathon.